Last year, the folks behind GOG announced plans to launch their own PC gaming service, GOG Galaxy, to compete with Steam and Origin. Today, it’s finally going public. GOG Galaxy, which you can download here, is now in open beta. Like Steam, Origin, and other PC gaming clients, it’s a stand-alone program with its own achievements, friend lists, and massively restrictive DRM. Just kidding. Anyone who follows the people behind GOG—a subsidiary of Witcher 3 developer CD Projekt Red—knows they’re as anti-DRM as it gets. GOG Galaxy features one-click installation and auto-updates for its library of over 1000 titles, but it also stays true to GOG.com values: it’s all optional. 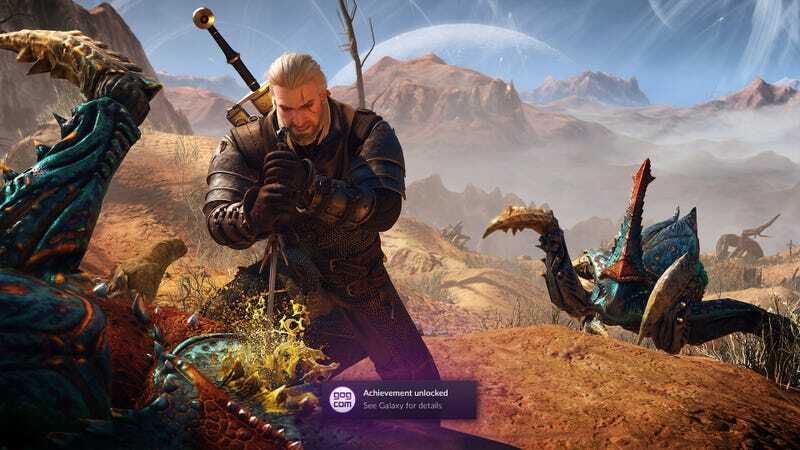 Automatic updating can be disabled for any game; but if you leave it on and a patch breaks something, GOG Galaxy will offer its rollback feature to restore a previous version of the game. Gamers can also download a standalone, DRM-free backup copy of every game, so keeping purchases safe is easier than ever. This is exciting news—not just because GOG is amazing (seriously, I’ve used it to buy way more games than I have time to play)—but because Steam desperately needs some real competition to take down its monopoly over PC gaming. EA’s Origin and Ubisoft’s uPlay, which are each restricted to their respective publisher’s games, never came close. GOG Galaxy offers friends list, game time tracking, achievements, and chat. Gamers can now talk to each other, connect with their group of friends, and see what their friends are playing. GOG Galaxy is also an online multiplayer & matchmaking solution that, in select titles, includes cross-play: platform-independent multiplayer between gamers on GOG.com and Steam.